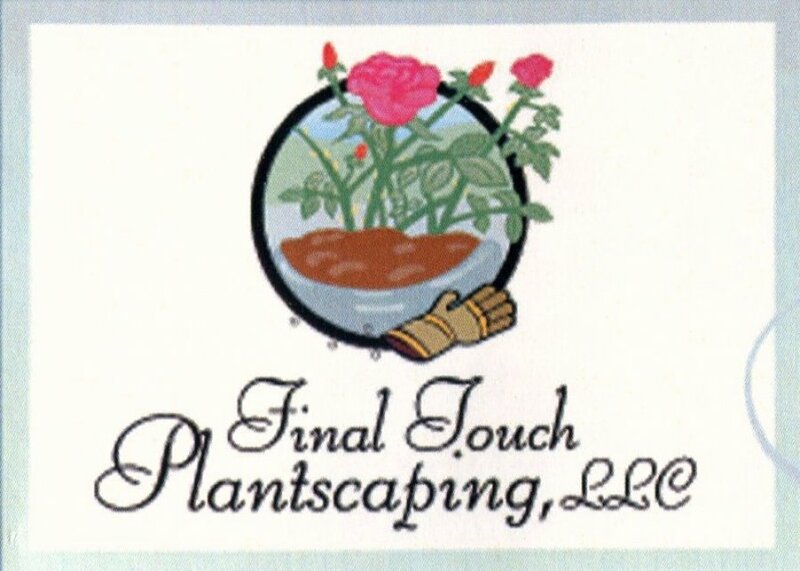 Laura Ann DePrado, born and raised in Sussex County New Jersey, is a Registered Horticultural Therapist, Columnist, and founder of Final Touch Plantscaping, LLC, in Branchburg New Jersey. She specializes in connecting people and plants through customized activities and programs from children through seniors, and has written countless articles as a columnist for Gannett Publishing, and freelance writer for numerous publications. Laura has a BS in Journalism from the University of Northern Texas, and Horticultural Therapy Certificate from Rutgers University. In her last semester at Rutgers SEBS in January 2011 Laura had a brain tumor removed. 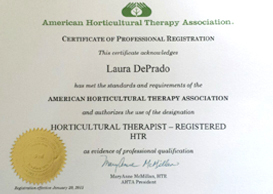 In January 2015 Laura achieved the professional credential of “HTR”, horticultural therapist registered by the American Horticultural Therapy Association. 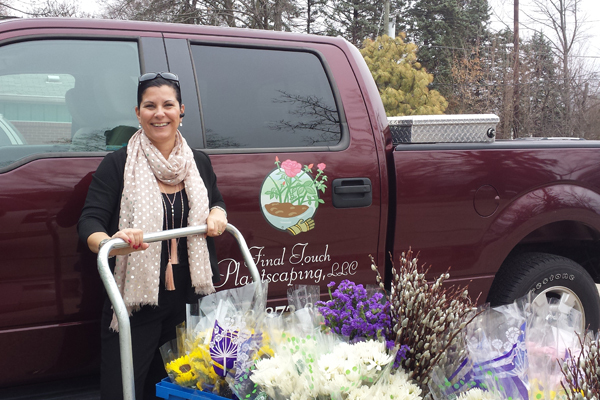 Laura has infectious energy, passion for people and gardening with a purpose and is committed to serving others through her vocation and avocation as a business leader, Rotarian, and mentor to scouts, 4H youth, students at Rutgers University, County College of Morris, Raritan Valley Community College. She introduced, implemented and expanded programs at the Adult Day Center of Somerset County, Windsor Health Care Communities Abingdon Care and Rehabilitation, NJ Firemen’s Home, Chelsea Living, Care One, Rotary District 7510, Anderson House, Rutgers NJAES and Cooperative Extension, Allies, Inc., Carrier Clinic, Groundwork Elizabeth, Community Access Unlimited, American Horticultural Therapy Association, and the Mid Atlantic Horticultural Therapy Network. 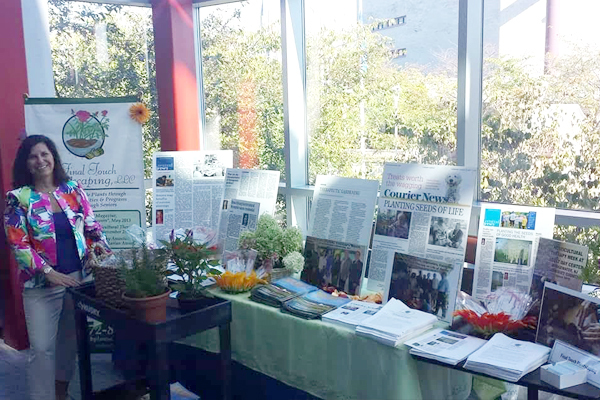 She presented at the First Annual New Jersey Health and Wellness Expo in October 2016. She is a Friend of the NJ Department of Agriculture. She is a longtime member and friend of NJNLA. She is a dedicated member of The 200 Club of Somerset County, and Ambassador of The Somerset County Business Partnership. In October 2015 Laura was nominated to New Jersey First Lady Mary Pat Christie’s “NJ Heroes”. 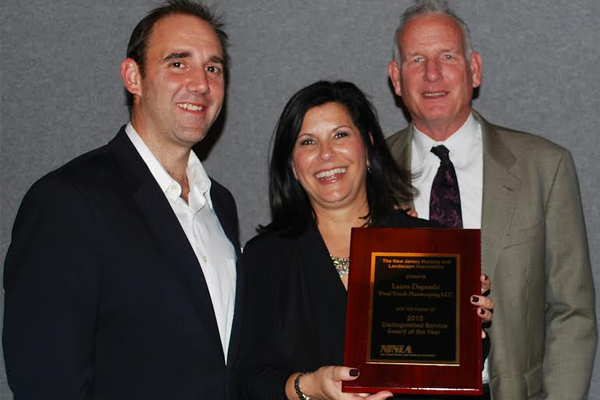 She received the New Jersey Nursery and Landscape Association’s 2015 “Distinguished Service Award” for expanding the Horticultural Industry in New Jersey with Horticultural Therapy. 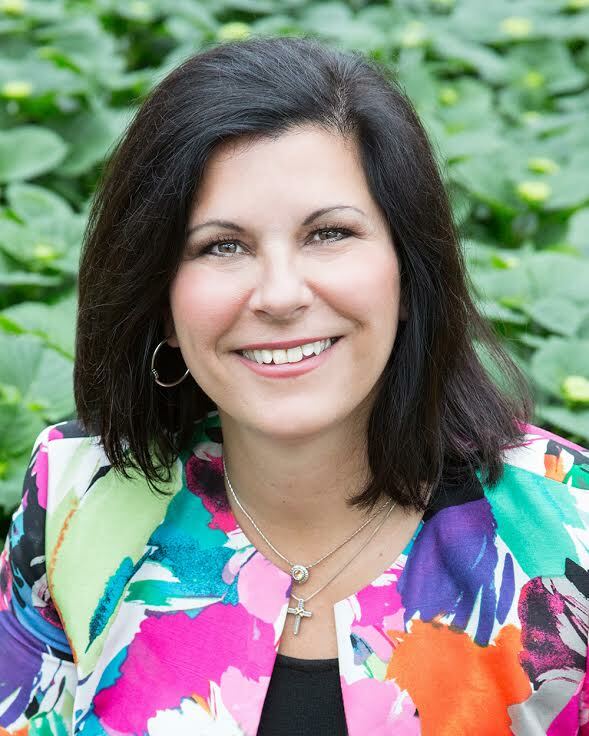 She is a Board of Trustee of the NJ Agricultural Society, American Horticultural Therapy Association, and three-time national presenter. 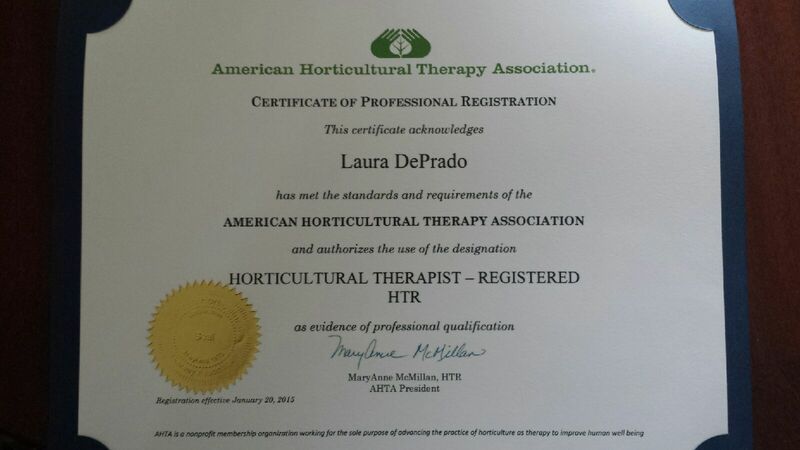 She achieved Internship Supervisor status with the American Horticultural Therapy Association in October. She is the recipient of numerous awards including The 2013 American Horticultural Association’s Alice Burlingame Humanitarian Award, 2014 Boy Scouts of America “Toast to Scouting” Award, and The Rotary Paul Harris Fellowship Award. 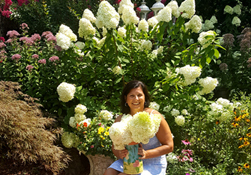 She is a featured columnist for Gannett Publishing, writer for state and local magazines and co-author Rutgers Fact Sheet “Enabling Gardens: The Practical Side of Horticultural Therapy”. 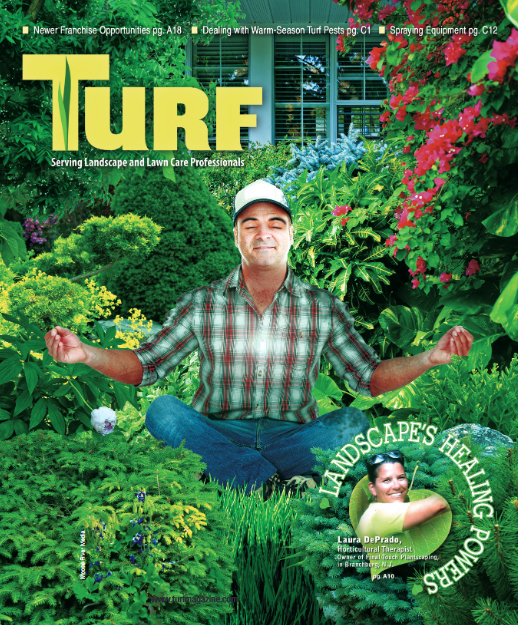 Her work has been featured in Turf Magazine and Edible Jersey Magazine, and she has underwritten Horticultural Therapy Resolutions at the New Jersey Agriculture Conventions in 2013, 2014, 2015, 2016, and Governor Christie signed into law on May 11th legislation designating the third week of March Horticultural Therapy Week in NJ beginning in 2016. Congressman Leonard Lance issued federal Proclamation, and Ceremoniall Senate Resolution inauguration took place in The New Jersey Senate on March 14th 2016. Hunterdon and Somerset Counties issued Proclamations in celebration of Horticultural Therapy Week. At a special ceremony orchestrated by Laura, in August, 2015, at Melick’s Town Farm, Congressman Lance flew American Flag over the U.S. Capitol in honor of one of Laura’s senior clients, and he presented her with the Flag. The Senate and Assembly issued Citation, and Hunterdon County Board of Chosen Freeholders issued Proclamation in celebration of the impact of horticultural therapy on this senior’s life. Laura is a dedicated wife, married to Michael 22 years, and mother of John, age 21, U.S. Army Sargent and Ranger, and Jenny, a junior at James Madison University. They also have three adorable rescue dogs.